Getting records pressed costs a good chunk of change. Wait, what does “all-in” mean? It means the price we give you includes all costs. You say “go” and we put records in your hands. No sneaky taxes. No extra shipping costs. No brokerage fees. Nada. 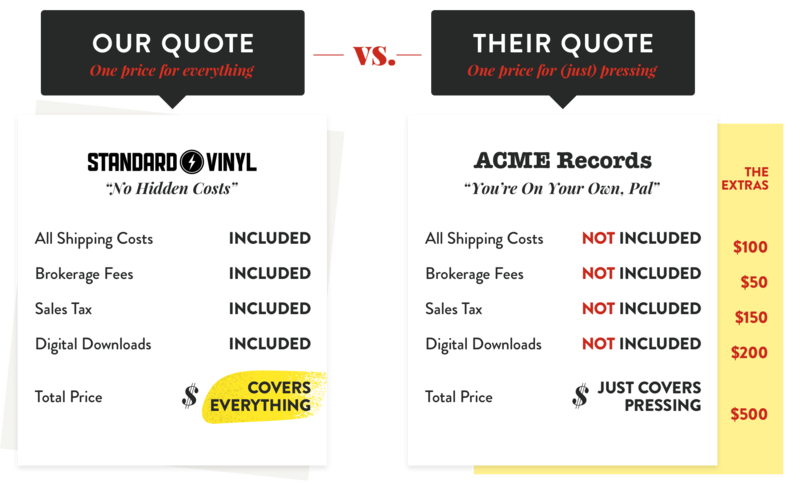 If your Standard Vinyl quote seems more expensive keep in mind that it’s rarely an apples-to-apples (er, vinyl-to-vinyl) comparison. Make sure the lower quote includes all of the costs to get the records into your hot little hands… because, that’s how we roll. It’s important to know that if you’re in Canada and you’re getting records pressed by a manufacturer in the States or Europe, shipping is going to be really expensive. Records are heavy. Just ask the UPS or FedEx guy when he drops off your 500 LP’s in gatefold jackets — make sure he’s lifting with his knees. Bond fee (typically around 3% of the declared value on the commercial invoice). This is assuming you ship the records the most economical way via UPS ground. In most cases, these additional costs can easily add a few hundred dollars. When you factor in shipping too you’re looking at $500 more than what was originally quoted to you. Not cool. And then there’s the test pressings! You’ll need to have those shipped to you as well and that’s a cost manufacturers will rarely cover for international customers. If you’re shopping around be sure to ask the company you’re dealing with whether shipping and brokerage fees are covered in their quote. If you’re comparing quotes please remember that we include the shipping of your audio master, your test pressings, and ALL shipping costs associated for the final order in our quote.That’s why we say the price we give you is “all in”.